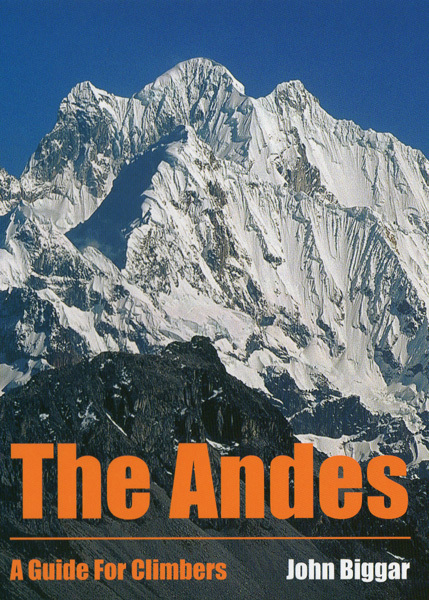 Listed below are some of the main errors that have been discovered in my guidebooks to the Andes. This is just a short list of actual mistakes. In other areas and on other peaks routes will have changed due to the passage of time and where new access roads have opened up. In towns and cities new shops open up and old ones close - these type of changes will be incorporated in the next editions of the books. Errata for the 4th edition will be added here when they are discovered. The guidebook was published in March 2015.
p. 41 -- Pico Colon -- This peak has been notoriously hard to get permission to ascend for many years. However it was climbed by the author in December 2015. The approach was from Palmor to the west and took 6 days, with a couple of days to climb the peak and four days to walk back out. 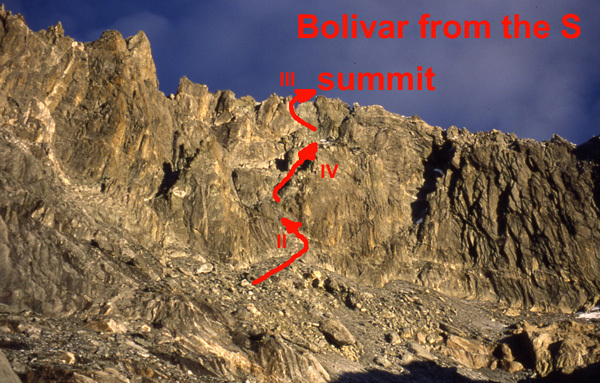 The ascent itself was made by the NW glacier couloir to the La Horqueta col and then easily up the SW ridge. Grade for Colon was PD, with a 60m pitch of 45º snow to gain the col. Bolivar looked quite a bit harder, certainly AD and with a lot of steep exposed snow. The summit height of Colon was c.5730m on the GPS. Bolivar is probably the same height plus or minus a few metres only. 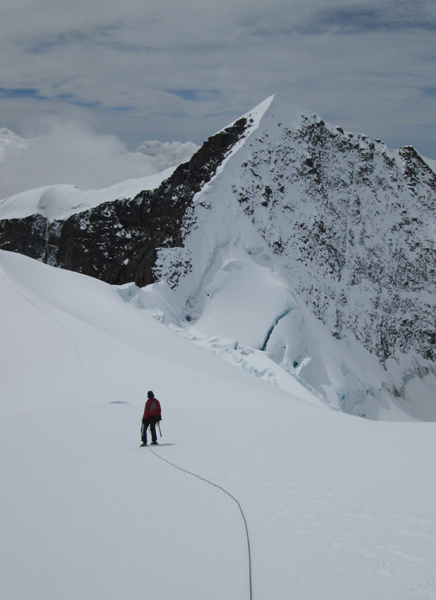 The picture below shows Pico Bolivar from just below the summit of Pico Colon. p.80 -- The main Caraz peak, Oeste, was downsized to c.5980m following photographic studies (also the lack of a 6000m contour on the PIGM maps). It's height is 6025m on the DAV map. Caraz Este is a lower peak, so it's height should be about 5975m (not 6020m as stated). Solimana -- A better start is from the new road (easy 4x4) to the N of the peak, parking at 15º19'46" 72º54'05"
p.182 & 183 -- Hualca Hualca -- the grade to the summit is just F in most conditions. p.186 -- CHACHANI -- A new route up the N slopes is now more commonly used, and will certainly be better if there is much snow on the peak. Drive to a 4x4 base camp at 5050m in a col N of the peak, from here walk W (almost level) for 1½h. to an advance base camp beneath the N side of the peak. Then easily up a good zig-zag footpath to the summit, normally only a little snow at 5900m+. KEY WAYPOINTS Parking 16º10'03" 71º30'45" Advance Base 16º10'38" 71º31'52" 5800m 16º11'21" 71º32'10" Summit 16º11'43" 71º31'55"
This diagram shows Chachani from the North, and the new route on the NW slopes. p.188 -- Pichu Pichu -- there is now a 4x4 track down the east side of the peak to a small parking area at 4580m at 16º25'23" 71º12'36"
p.221 -- Puntiagudo -- the height should read 5940m. p. 249 -- Aconcagua -- The permit system has changed slightly again. There are more or less the same requirements as before, but you now have to go through one of 8 or 10 approved operators to obtain your permit. The cost in the 2015-16 season was $720 to $945, low or high season. p.314. It was of course Maestri who made the claims about the first ascent of Cerro Torre, Toni Egger unfortunately died on the mountain. p.329 -- The Next Ten -- Tocllaraju c.5980m and Caraz c.5980m should be in this list, at least if their newly estimated (lower) heights are correct. See above for more details. Also published as individual chapter E-books, with ISBN's 978-0-9934387-?-? Errata for the E-book will be added here when they are discovered. 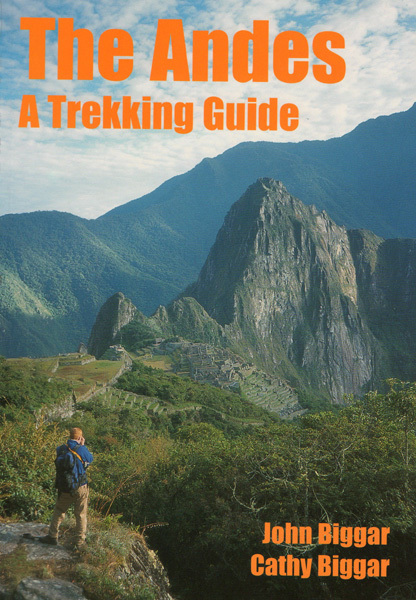 The guidebook was published in November 2015. The Chichicapac and Cunurana diagrams got transposed. Everything is correct, they are just not in the best places and you may have to scroll up or down a bit! Solimana --- A better start is from the new road (easy 4x4) to the N of the peak, parking at 15º19'46" 72º54'05"
Hualca Hualca -- the grade to the summit is just F in most conditions. Pichu Pichu --- there is now a 4x4 track down the east side of the peak to small parking area at 4580m at 16º25'23" 71º12'36"
Tres Cruces --- Puntiagudo -- the height should read 5940m. Aconcagua -- The permit system has changed slightly again, ore or less the same requirements as before, but you now have to go through one of 8 or 10 approved operators to obtain your permit. The cost in the 2015-16 season was $720 to $945, low or high season. Cerro Torre --- It was of course Maestri who made the claims about the first ascent of Cerro Torre, Toni Egger unfortunately died on the mountain. Please note that this climbing guidebook contains over 10,000 separate items of information and only a very small number have been found to be erroneous! See out latest Peak Lists pages for updated peak heights due to new research using the SRTM data. The following mistakes/corrections have been found in the 3rd English edition. Introduction - page 11 - The climates and best climbing seasons in Colombia and Venezuela are a bit more complicated than indicated on this page. In Venezuela the only really dry season is from December to March, most areas of Colombia are best from November to March, but with variations between the individual ranges in the country. Both Venezuela and Colombia are OK but not brilliant in July as well. A good tip is to look up rainfall statistics on Wikipedia for the city nearest your chosen venue. Venezuela -page 30 - Note that as of January 2009 the Merida Teleferico is permanently closed. There are rumours that a new one will be built by November 2013, but for the time being Bolivar will take 6-8 days to climb, from La Mucuy. - page 31 - the route has been printed wrongly on the Pico Bolivar diagram - all the red arrows and text should be 2cm to the right. The correct route passes close to the three prominent circular shadows as shown below. Colombia - page 36 - the Central Nacional de Montaña at Transversal 10 in Bogota has moved - the old address is now a Shell petrol station! New address is at Diagonal 108 #9A-11, just a few hundred metres away. 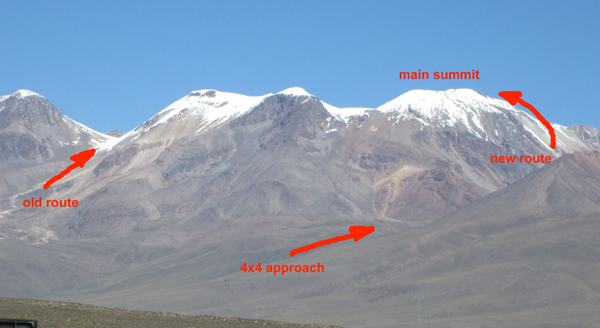 - page 39 - We now believe Nevado El Ruiz to be 5311m at the highest point on the crater rim. This height is taken from a newly seen 1:12,500 Colombian IGM map, backed up by handheld GPS readings. Northern Peru - page 62 - Alpamayo is now generally climbed by routes further right due to the Ferrari route being threatened by a serac. Argentina - page 189 - Fiambala - generally speaking you don't need any permits these days, but have a chat with Jonson before you head to the mountains - his office is in the same place but it is now labelled "Seguridad Turistica" and no longer "Direct TV"
Argentina - page 200 - Olivares access - a new mining road in the San Lorenzo valley may cause access problems. Maule and the Lake District - page 230 - Volcan Copahue the climb "Easily by the SE slopes" should say NE slopes. 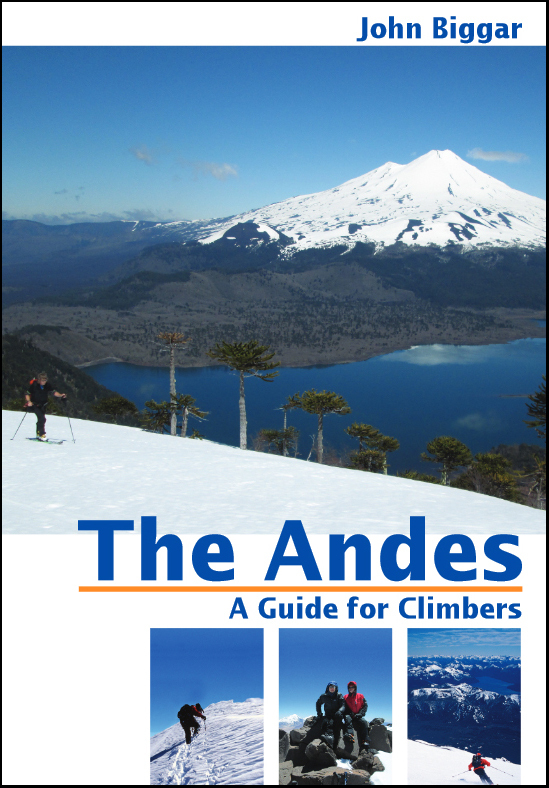 Maule and the Lake District - page 236 - Volcan Lanin, Chilean Access. The Chilean border post has moved and is now located just 1km before the border, which may complicate Chilean access. We've had feedback on nearly all the treks since the book was published (except for the Colombian ones) and only the following points have been brought to our attention. Venezuela - page 27 - it is no longer advisable to walk between the 1st and 2nd cable car stations as the route is now severely overgrown. Other sections of the cable car walk are fine. - page 27 - 6th line from bottom of page - "Laguna Mucubaji" should read "Laguna Negra"
- page 30 - Note that as of January 2009 the Merida Teleferico is permanently closed. There are rumours that a new one will be built by November 2013, but for the time being Bolivar will take 6-8 days to climb, from La Mucuy. Colca Canyon - page 86 - the route above Choco is very hard to find, probably best to take a local guide to show you the way. Illampu Circuit - page 93 - problems with bandits near Laguna San Francisco are now much worse - seek local and up to date advice before proceeding. Pomerape Circuit - page 107 - there is a minefield on the South side of the lake on the Chilean side of the border - so take care and walk around the North side of the lake!